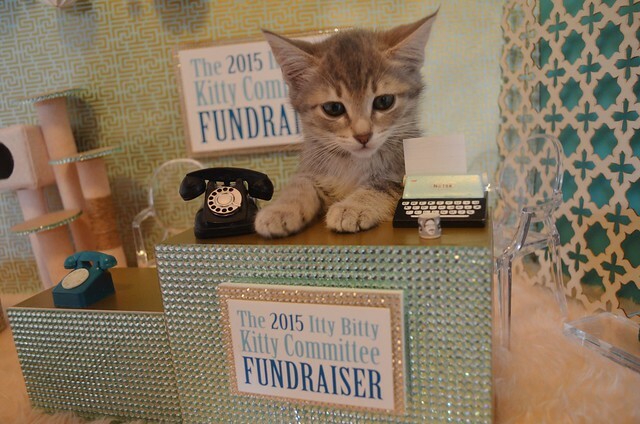 The Itty Bitty Kitty Committee: Live From the IBKC FUNdraising Headquarters: This FUNdraiser is Off the Hook! Live From the IBKC FUNdraising Headquarters: This FUNdraiser is Off the Hook! WOW! What an afternoon! Things sure went crazy 'round here in those last couple hours of the match. I think I must have taken a squillion calls. 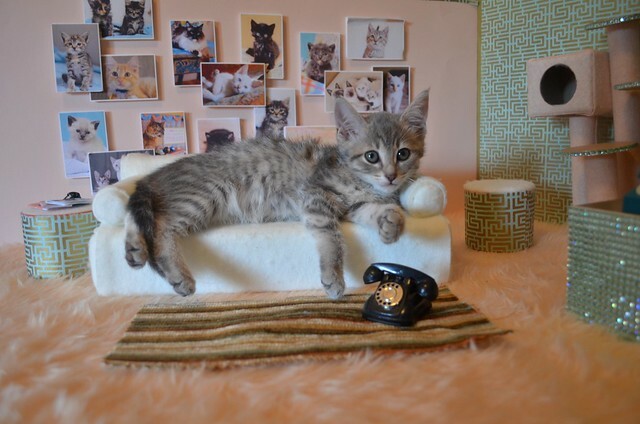 I may have sprained a whisker answering all those phones. I've got just a couple of hours left in my shift, and it's quieted down. I think I'll just relax on the couch. 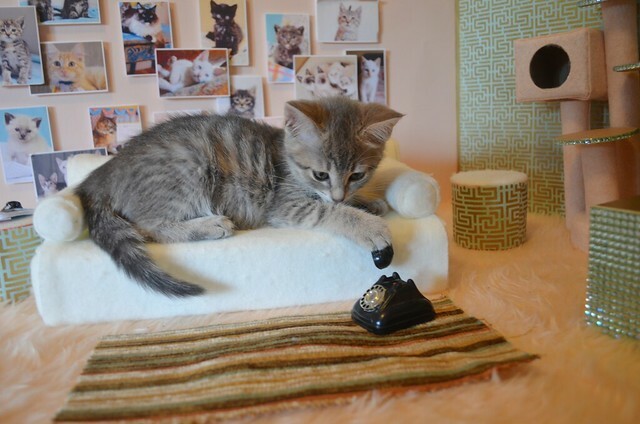 I can get up when the phone rings. I'll just move the phone over here, too. That way, I'll be able to pick it up faster if it rings. Maybe I could just take the phone off the hook. People will just think the line is busy and call back a little later, right? Evelyn's up next. She will be happy to have a few calls during her shift. Oh dear, if you're having trouble getting through, maybe you should try making your donations online! To make a tax-deductible donation, please visit our Firstgiving Page. Until midnight tonight, all the donations that come in will go towards the Barn Cat and Backyard Buddy program. If you're just tuning in, scroll down the page and you can learn all about this program in previous posts. Thanks for the great day! 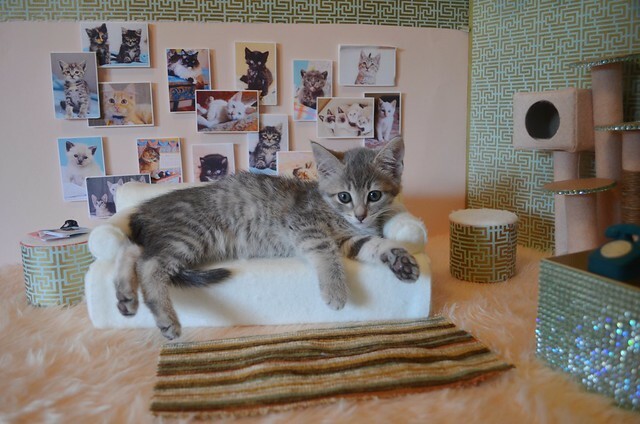 So far, we've raised a ton for our Barn Cat and Backyard Buddy program. I honestly didn't think we were going to meet the match today. It was slow going in the morning and early afternoon, too. There was a point when it didn't feel possible, but of course, you all never disappoint! Thanks to you generous, caring folks, we had a big surge at the end and we made it happen! Thank you to our Awesome Anonymous Donor for offering up this great big match for us to meet! We've got just one day left and it's going to be a busy one! We'll have a morning match followed by a big one in the afternoon, and hopefully we will roll past our goal at a reasonable hour! I'll be back bright and early tomorrow, so we can get a good jump on the day. We'll see you then! Get plenty of rest, it's going to be a busy day! love these images with hilarious titles. Laurie you are so very creative! you make my day every day! thank you! Don't forget to apply for worker's comp for your sprained whisker! It can go toward this wonderful fund raising!! !